Manatees use the upper Crystal River area as a refuge to escape the cold. Manatees have a new sanctuary to resort to when they are feeling harassed by eager tourists at Three Sisters Spring at Kings Bay in Crystal River, Fla., reports the U.S. Fish and Wildlife Service. The sanctuary, which was set aside on a temporary, emergency basis last November, covers less than one-fourth of an acre. 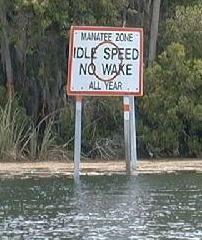 It allows manatees to retreat from people during their long winter stay in the area. All waterborne activities are prohibited in the area from Nov. 15 through March 31 of each year. The sanctuaries were created after the Fish and Wildlife Service received numerous reports of harassment for concerned citizens, researchers and wildlife managers. Currently, there are six manatee sanctuaries in the Crystal River's headwaters at Kings Bay that protect approximately 39 acres of essential manatee habitat. The sanctuaries were created to provide manatees areas where they could retreat from people during their winter-long stay in the area. According to the USFWS, Kings Bay is the most important winter refuge for manatees on Florida's west coast. 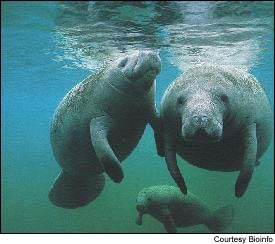 More than 250 manatees are known to winter here and the manatee population is slowly increasing. Crystal River dive shop owners and marina operators inform their customers about the crucial importance of such things as observing boat speed limits in manatee zones, not feeding manatees, and avoiding interaction that disrupts the species' normal patterns of activity. Local dive shop operators provide their customers with videos and handouts that describe "manatee-friendly" ways to interact with manatees. articulate to help maneuver food or dig through sediment. more than 3,000 lbs. Calves are born weighing about 40 lbs, gaining about 700 lbs. during their first year. resting, and traveling. On average manatees can travel about 40 to 50 miles a day, sometimes farther. Chessie, the famed manatee rescued from the cold waters of the Chesapeake Bay and returned to Florida, was tagged with a locating device which showed he traveled as far as Rhode Island during hot summer months. however, that they know exactly where swimmers are, even in black-out conditions. believed to have the capabilities of echo-location. being produced or if they serve any other purpose. 10 to 15 minutes when resting. They are capable of exchanging 98% of their lungs capacity in one breath. body at the surface are clues which reveal the presence of manatees in the area. canals, particularly where seagrass beds are located. Manatees are completely herbivorous and can eat 10-15% of their body weight daily. In captivity they are fed lettuce and other greens, and given elephant vitamins. REPRODUCTION : Females mature around 5 to 9 years of age, and males not until 6 to 9 years of age. 13 months. Newborns weigh approximately 40 pounds at birth and stay with the mother for several years.